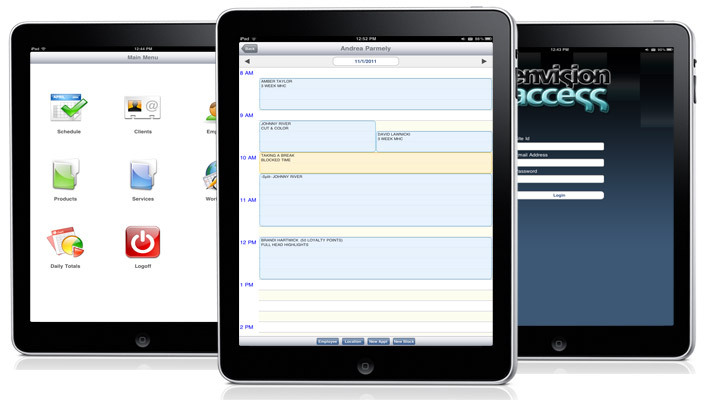 All appointments and adjustments made in the app are sent in real-time to your Envision Software. Connect to the app over any speed internet connection including Wi-Fi, 3G, 4G, and Edge. The security options in the Envision Access App are the same as those set up for Envision Access. Easily adjust your employees' security settings from within the Envision management software. PLEASE NOTE: To use this application, you must have Envision Software Version 6 or higher and have a subscription to Envision Access. For more information on Envision Access, please continue to the main site, or contact one of our business consultants at 800-231-9445. * The Envision Access iPhone and iPad apps are included for free with your paid subscription of the Envision Access service.